2016 will be a critical year for farm finances and land values. North Dakota land values declined for the second consecutive year in 2015. This follows an 11-year period (2003 to 2014) in which cropland values averaged an annual increase of 15 percent, the strongest sustained run-up in cropland values in the past 100 years. “Going forward, the question is: How fast and how far will land values decline?” asks Andrew Swenson, North Dakota State University Extension Service farm management specialist. Swenson derived regional and state average cropland values and rents from the published results of a January 2016 county survey commissioned by the North Dakota Department of Trust Lands. Based on the survey, North Dakota average cropland values declined about 4 percent during 2015. Swenson noted that a report by the North Dakota Chapter of the American Society of Farm Managers and Rural Appraisers indicated a greater decline, 9 percent, for 2015. Cropland values (January 2015 to January 2016) were the strongest in the northwest region, increasing 13 percent (to $1,185). Crop enterprises that are more common in the northwest, such as durum, field peas and lentils, were generally more profitable in 2015 than other crops. Another possible reason for the strong increase is that this region has lagged behind the rest of the state and may have been catching up. Over a 10-year period (2004 to 2014), land values increased around 300 percent or more for all regions but the northwest, whose land value increased only 170 percent. Also, past income associated with the region’s energy development may have provided some buoyancy. Several regions were essentially flat, being within 1 percent up or down, from last year. 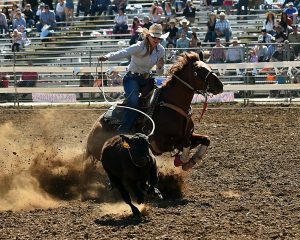 They were the south-central region ($1,673), the northern Red River Valley counties ($2,983), the southwest region ($1,426) and the north-central region ($1,745). In general, regions that had experienced the greatest increases during the period of escalating prices had the strongest declines in land values during the past year. The southeast region (to $2,918) and the northeast region (to $1,752) dropped 4 and 8 percent, respectively. Cropland values declined 12 percent during 2015 in the region consisting of southern Red River Valley counties (to $3,826) and the east-central region (to $2,014). 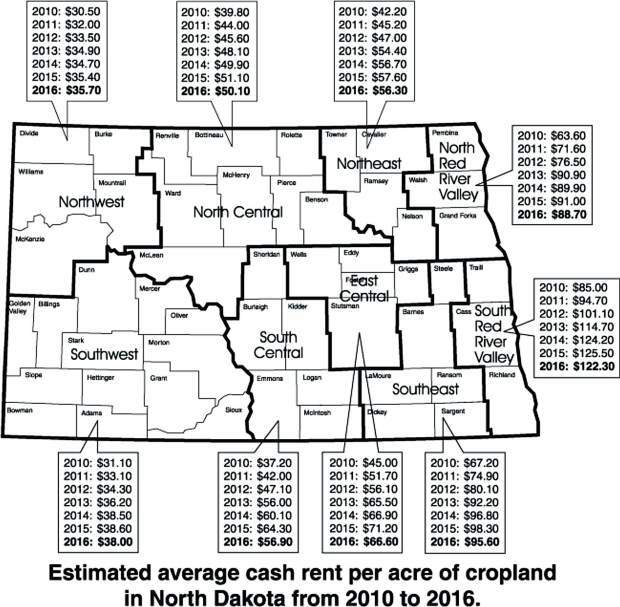 Several regions had a decline in cropland cash rental rates between 1.5 and 3 percent: the southwest (to $38), the north-central (to $50.10), the northeast (to $56.30), the northern Red River Valley (to $88.70), the southern Red River Valley (to $122.30) and the southeast (to $95.60). Cropland cash rents declined 6 percent in the east-central region (to $66.60). The largest decline, 11.6 percent, occurred in the south-central region (to $56.90), which had experienced the greatest percentage increase relative to other regions from 2004 to 2014. Although there was significant variation among regions, North Dakota average land rents increased 80 percent from 2004 to 2014, compared with a 325 percent increase in land values. Now the question is: How far and how fast will land values drop? The last significant period of declining land values was from 1981 to 1987. Land values dropped a total of 40 percent. It took 24 years, until 2005, for prices get back to the 1981 level. Crop profitability and interest rates drive land values. A general theme pushing land values and rents has been lower interest rates and strong crop profitability, as high prices and strong yields have outpaced increasing costs. Costs of production more than doubled from 2004 to 2014. When North Dakota marketing year average prices, from 2012 to 2014, dropped by one-third for wheat and soybeans and one-half for corn, the impact on profit was severe. According to the results of farms enrolled in the North Dakota Farm Business Management Education program, average net farm income in 2015 will be the lowest in 17 years. Swenson believes 2016 will be a critical year for farm finances and land values. Strong yields will be very important. Although the impact of large yield shortfalls will be mitigated by crop insurance, mediocre to slightly poor yields, coupled with the low market prices, could create a farm financial crises. Unfortunately, current projected crop profitability for 2016 is very poor and Swenson expects land values to drop by 5 to 10 percent.